Capital of the New Kingdom for 500 glorious years, and spiritual centre for much longer, Luxor contains the crowning achievements of Egyptian civilisation. Its temples and tombs are amongst the most extraordinary monuments ever built through time. The East Bank of the Nile, like elsewhere throughout the valley was the site for temples and prosperity. The West Bank signified death, burial grounds and tombs. Religion permeated the entire life of the ancient Egyptian—socially, politically and economically. Every detail of their life and that around them was conceived to be dependant upon the gods. From the very beginning, Egyptian religion was based on a large and complex pantheon of gods and goddesses, both zoomorphic [animal form] and anthropomorphic [human form]. There were gods not merely to represent various ideas and aspects of human life, but each locality also had its own particular deity. And when these localities grew in importance or were united under the pharaohs, the gods were united too. The most powerful of the gods were Osiris, god of the dead and underworld, god of the earth and vegetation, and responsible for civilising Egypt; his wife Isis, sister Nepthys, falcon-headed son Horus, and brother Seth; Anubis, the jackal-headed god of mummification; Ra, the sun-god of Heliopolis; Thoth, the ibis-headed god of wisdom and learning; Hathor, the cow-goddess of love, music, dance, joy and childbirth; Ptah, patron of craftsmen and creator of the world; and Sobek, the crocodile god. Amon, the local god of Waset aka Thebes aka Luxor started to rise in importance during the Middle Kingdom (11th, 12th Dynasty; 2040-1640 BC). Thebes was where the Middle Kingdom pharaohs came from, and the rulers credited Amon, the local god, with the reunification of Egypt. Amon meant hidden. He was believed to be invisible and sometimes seen as the very breath that gave life to all living beings. However, even spirits needed representation in a society enamoured with pictorial forms and so Amon was shown sometimes as a ram or as a goose, but most frequently as a king with a pair of feathers on his crown; one each for the lands of Upper and Lower Egypt. When in subsequent centuries Amon was united with Ra, the sun-god of Heliopolis, the crown started including the rays of the sun. 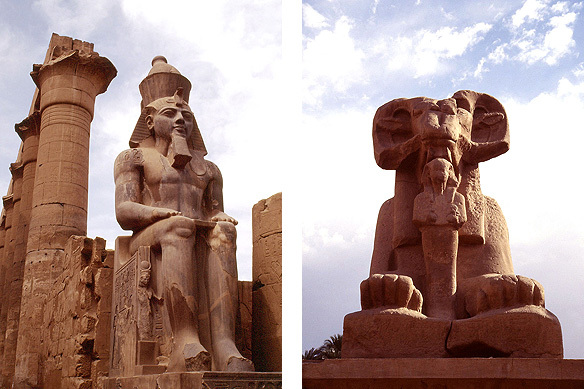 By the beginning of the New Kingdom (18th, 19th, 20th Dynasty; 1550-1080 BC) Amon had been raised to the level of a state-god and the temple complex at Karnak, Thebes, became the most important religious and intellectual centre in the ancient world. Most Egyptians, no matter which god they believed in, envisioned that the birth of the world started with the rising of the primordial hill from the chaos of ancient waters. 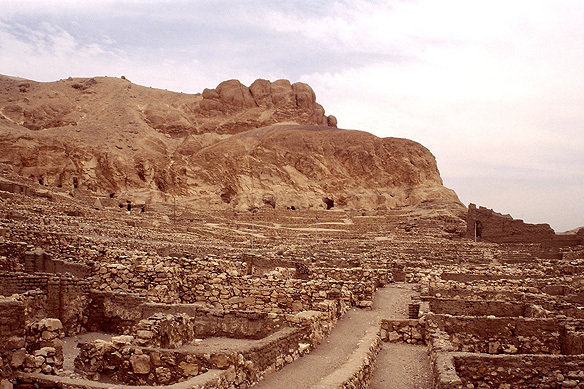 The priests of Memphis, Thebes, Heliopolis and Hermopolis all claimed their cities to be the hill. Religion, in addition to gods and goddesses, invariably also comprises an ‘ethics’ element. 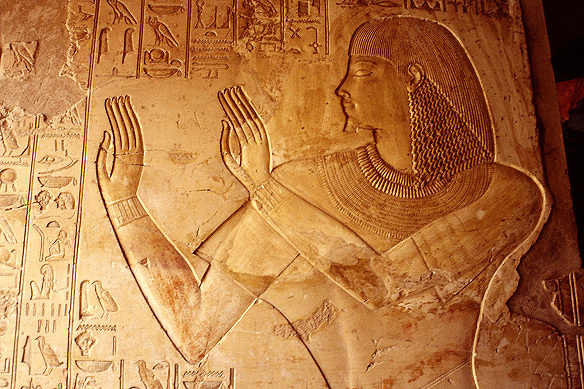 The ethic of the Egyptian religion was Maat, a combination of justice, truth, righteousness and order. It was a quality not of man but of the world. When the gods created the world they endowed it with Maat and created it precisely as they wanted it. Everything was fixed, eternal and right. When man lived in harmony with the world, doing his duty, he was in harmony with the gods. There was no concept of a better age before, or one yet to come. The world was ideal just as it was, famine and war merely temporary setbacks. There were two main kinds of temples during the New Kingdom: the mortuary temple devoted to the cult of the dead pharaoh and temples dedicated to a god in which the cult image of the god was housed and worshipped. The temples of the gods were massive walled structures made of sandstone. They were designed to be enjoyed more from the inside than the outside and consisted of a pylon (which discouraged intruders), a roofless colonnaded court, a lofty covered hall with a ceiling and the inner sanctuary. The public were allowed in only during festivals and even then not beyond the first court. Gods were perceived to have the same needs as humans, i.e. food, cleanliness, rest and entertainment. These were provided for by the priests. Throughout the Nile valley the priests performed an elaborate ritual every morning chanting prayers and burning incense which remained unchanged during their 3,000 years of civilisation. Only the high priests who devoted their full time to the service of the gods were allowed to enter the inner sanctuary and assist in these rituals. Other priests made of specialists (astrologers, scholars, readers of the sacred texts, scribes, singers and musicians) and lower clergy (bearers of sacred objects and interpreters of dreams) served on a rotating basis. They lived within the temple for one month out of every four during which they forsaked their civil life and led a purely monastic one. They shaved their entire bodies, including their eye lashes, washed frequently, abstained from relations with women and wore a brief white linen cloth around their loins. Off duty, they lived in the secular world like everyone else. Women served as part-time priestesses whose services were limited to roles of singers and musicians. Polytheism created tolerance. By co-mingling the gods with the pharaohs and eventually the people, Egyptian religion helped to unite its people. The Egyptian people’s concern and enthusiasm about death, and subsequent quest for conservation, made them immortal. This entry was posted in Egypt, Exploring our World and tagged Al-Uqsor, Ancient Egypt, Capital of New Kingdom, Egyptian Antiquities Organization, Egyptian Civilization, Egyptian Gods and Goddesses, Egyptian Mythology, Hundred-Gated Thebes, Luxor, Nile Cruise, Things to see in Egypt, UNESCO World Heritage Site, Waset by Rama Arya. Bookmark the permalink.